Where does $150 translate into more votes? In New Orleans? Or in Guasdualito? Not shown: the voters in rural Venezuela that the campaign couldn’t mobilize because all the money ended up paying for this bus. Be forewarned, gentle reader: I come to bury the Mayamero voter in New Orleans, not to praise him. By now, you’ve probably heard the story: in one of its upteen zillion dirty tricks, the National Electoral Council shut down voting at Venezuela’s consulate in Miami, in a move to disenfranche tens of thousands of almost-entirely anti-chavista voters. It was a galling maneuver, nobody doubts that, and part of a sustained pattern of CNE ventajismo. 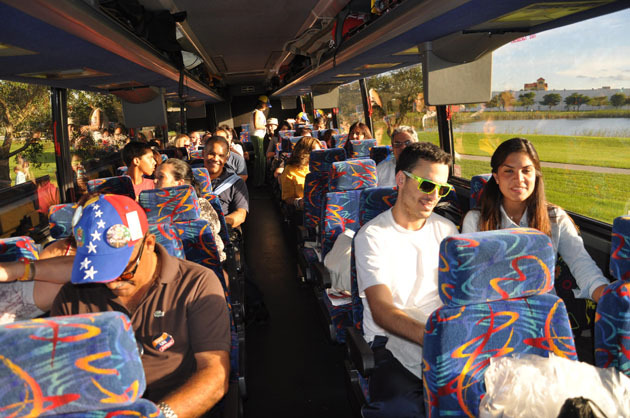 Since the decision came into effect, the opposition’s favorite folk has been a motley crew of Miami die-hards who’ve decided to call CNE’s bluff, bussing themselves hundreds of miles to their new appointed polling station, in largely venezolano-free New Orleans. Last October, 8,375 people voted for Henrique Capriles in New Orleans, the vast bulk of them from South Florida. This year, at least 3,000 are expected to make the trek. Everybody loves to love those guys…everybody, it seems, but me. Just bear with me here: It’s hard to imagine a roundtrip from Miami to New Orleans is doable for less than $150 – probably quite a bit more once you’re through with gas, lodging, food, etc. Now, let’s estimate 7,000 mayameros make the trek tomorrow. At $150 each, that’s over a million dollars spent on this ego-gratification stunt. A million dollars, you will notice, that the Comando Simón Bolívar won’t get to spend mobilizing people back home, where $150 dollars pays for enough cachitos, telephone cards and taxis to mobilize…well, I’m not sure how many, but certainly many more voters than one. Mayameros in New Orleans cast the most expensive votes in Venezuela – save from the poor deluded souls that actually fly back home from North America or Europe to cast a vote, wasting thousands in the process instead of re-registering in their new home consulates. It’s our old friend opportunity cost again. Each mayamero-in-New-Orleans’ warm, fuzzy sense of fulfilled duty costs Henrique Capriles at least two, and probably more like 4 or 5 votes not mobilized back home, where mobilization is run on a desperate shoestring. Or, put another way, if you don’t think Henrique Capriles is competent enough to turn an extra million bucks in campaign money into substantially more than 7,000 extra votes, why the heck would you want to vote for the guy in the first place? But remember, we’re supposed to celebrate those guys…their moral courage, their entrega! Ugh.